It was the home opener for the Bulls Saturday in the United Center, and it was the beginning of a season long celebration of the 20th anniversary of the franchise’s first NBA title. So Derrick Rose played his part perfectly in the Bulls’ thrilling 101-91 comeback victory from 21 down and 15 behind in the fourth quarter. For when the NBA wakes up Sunday morning to the second week of the 2010-11 NBA season, the league’s leading scorer will not be LeBron James or Kevin Durant or Kobe Bryant or Dwyane Wade. It will be the 22-year-old Bulls guard, now averaging 33.5 points after equaling his career-high with 39 points to go along with seven assists and six rebounds in the win. Sure, it’s just two games, but if the Bulls are to survive the first month of the season without injured Carlos Boozer, they are going to need Rose doing his Michael Jordan, circa 1990-91, imitation, which Rose seems very capable, amazingly enough, of pulling off. “He recognized where we are and what we need from him,” said Bulls rookie coach Tom Thibodeau, who got his first NBA victory and a game ball from Rose. Yes, he even thinks of it all as well. “He’s gotten to a point where he can figure out the game, and whatever is needed for us to win, he’ll try to provide. 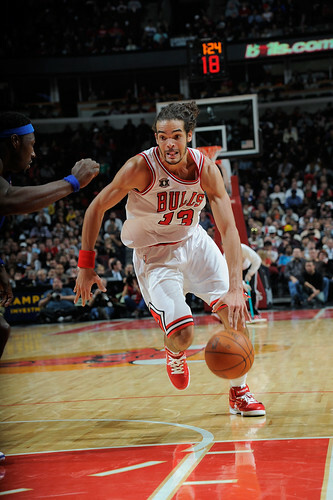 What we need from him is more scoring and he’s providing it,” said Thibodeau. “But he’s also making the correct plays. So if they double and a second man is coming, we want him to hit the open man, have the offense moving with pace, get the ball up more quickly for easier scoring opportunities. 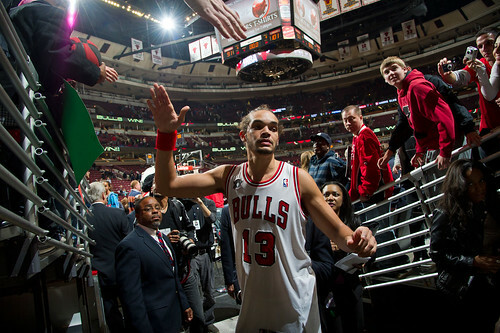 Yes, Noah was relentless again and his 36 rebounds in two games leads the league. 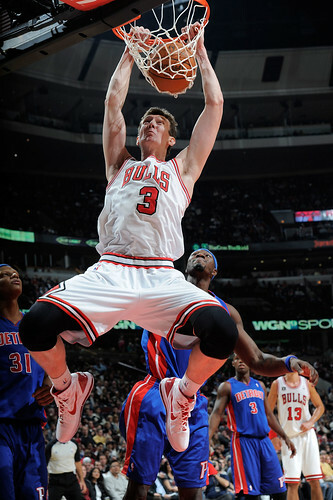 Asik had just two points and five rebounds, but his position defense and help was terrific in the crucial fourth quarter rally as he drew charges on Ben Gordon and Charlie Villanueva in the fourth. 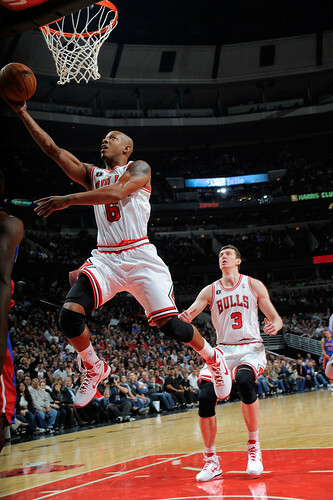 Johnson finally showed the promise the Bulls hoped for in drafting him 16th last year. He finished with eight points, nine rebounds and four assists, but he had six points, eight rebounds and three blocks alone in the fourth quarter when he played the full 12 minutes in an amazing 34-9 Bulls fourth quarter runaway to take control of the game. It reminded me, actually, of that 2000 Lakers conference finals win over Portland when they rallied from 15 down in the fourth and steadily pulled away with the stifling defense and aggressive play on the boards. Johnson basically took Deng’s minutes in the fourth quarter and delivered the rebounding Deng hasn’t been providing as yet, though Deng was terrific in defending Gordon after Gordon had 21 points in the first half, 19 in the second quarter when the Pistons stunned and quieted the home crowd with a 63-44 halftime lead. It grew to 65-44 early in the third. 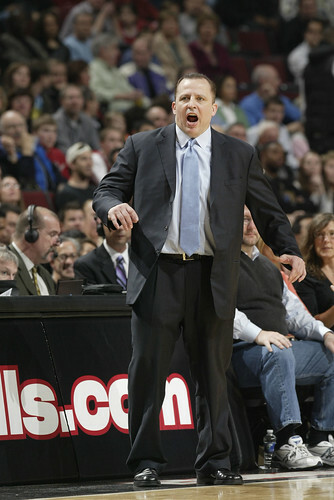 It was a brutal first half in which Thibodeau pretty much tried everything. He played all 12 guys and called two timeouts less than four minutes into the second quarter with the Bulls down 36-23 by then and listing badly toward 0-2. Rose was doing all he could with 10 points in the last five minutes of the half as he seemed to be looking around and finding the posse still looking for saddles. 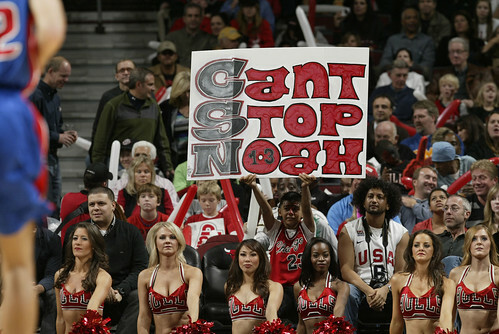 Noah was screaming encouragement, but with one rebound in nine second quarter minutes it wasn’t clear whom he was encouraging. 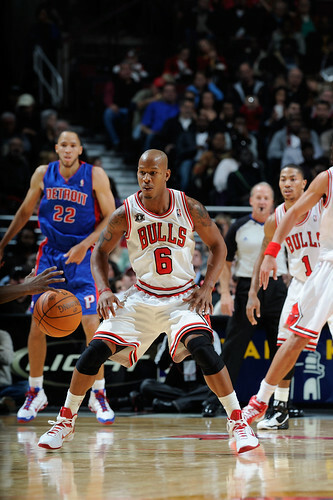 Though the Bulls only shaved four points off the Pistons lead in the third when Noah and Rose made late turnovers and Charlie Villanueva hit a three Thibodeau called a dagger, it was the adjustment of moving Deng onto Gordon, who suffers against size, and Deng’s knowledge of Gordon that began to take Gordon out of the game as he was scoreless after halftime. 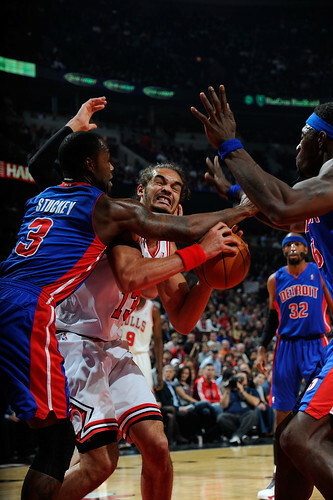 Indeed, the Pistons are an impatient, somewhat selfish team that plays a lot of isolation ball. So with Deng making it hard to get the ball to Gordon, they just looked elsewhere as Gordon was zero for three in seven third quarter minutes. Though Gordon, ever proud and defiant, was having none of that. And though Deng did a good defensive job on Gordon as he did on Kevin Durant in the opener, his offense remains lost after a good preseason (seven of 23 in the two games). And that’s something the Bulls at this point cannot afford. Which, of course, will immediately bring calls to move Johnson into the starting lineup as he was very good, though with his usual few overeager plays where he goes dribbling out of the backcourt after a rebound and losing the ball. It is just one game, and his energy probably is more vital, assuming he can keep it up, coming off the bench. After a crucial such turnover when the Bulls pulled within 86-80 with 6:44 left, every time thereafter Johnson stopped in the backcourt and looked to hand off to Rose. The question will arise because the shooting guards again were poor. Keith Bogans, who did return to add some good third quarter defense though Gordon destroyed him in the first half, and Ronnie Brewer were again ineffective, combining for four points. It’s hard to survive when you cannot count on scoring from the only position on the floor that is named for scoring. It’s thus highlighted even more the need for Deng to do more, though his first two shots spun in and out and it seemed to make him a bit more tentative. The Bulls also didn’t get much from C.J. Watson and they haven’t yet seemed to work into the offense the screens needed to free Kyle Korver, who was just one of five for three points, though he grabbed several big fourth quarter rebounds. This was an awful lot like the Bulls of the late 80’s and into the early 90’s when it was routine for the team to have three double figure scorers, as they did Saturday with Taj Gibson scoring 11 but without a rebound and Noah adding 15 points and three blocks to his 17 rebounds. Heck, it was a game with a small Pistons front court that Noah even had to go to a few post moves, or whatever that is he does from near the basket, though it can be surprisingly effective. Still, you cannot count on him to score double figures, other than with follows like he had to give the Bulls their first lead since late in the first quarter when he followed a Rose drive with 2:37 left for a 90-88 lead. 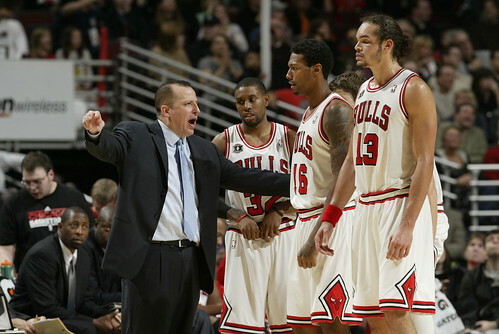 The Bulls, for all the other contributions, are going to have to ride Rose, and he seems fully capable and anxious to accept the responsibility. 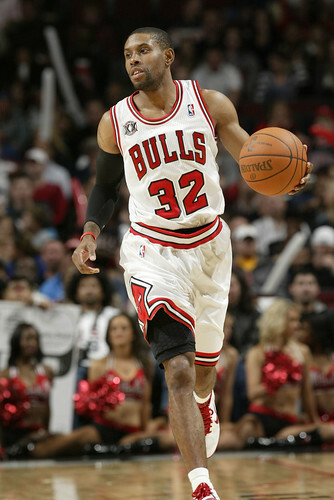 I watched Rose leave the court at halftime down 19 with his own Halloween mask on, one of anger and determination. Rose had 17 points at halftime, but just one trip to the free throw line. It was Oklahoma City all over again with the Pistons with a 23-5 edge in free throws at the half. 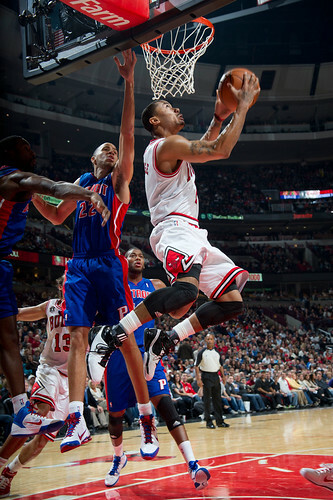 Rose had just four free throws in the opener despite 31 shots, and he made his own adjustment after halftime as well. Not only did he begin taking the ball straight to the rim, he began to cup the ball like a runner protecting the ball in football. So now when the defense slapped at it given Rose’s unusual strength, they weren’t dislodging the ball but committing fouls. As a result, Rose went to the free throw line 11 times after halftime and set a career high with 13 free throws attempted. See, the refs aren’t against him. We think. Not only does this kid learn every day, but he gets better and is now doing superstar stuff. Heck, he even made three of the Bulls five three pointers. See, he told you he can shoot them. Thibodeau, who made some nice second half adjustments in going in and out of zone a few times to further disrupt the Pistons offense, has been urging Rose not only to attack the basket but hit the elbow and go up as he can get that jumper anytime he wants, and he can make it. 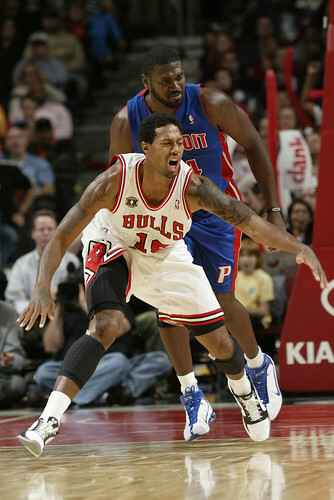 It’s helped make Rose even more aggressive on offense, and the activity around him was better this time than in Game 1. Johnson did help in that regard as he had the confidence to display his athleticism and go to the boards, which being 25 pounds lighter helped as well. 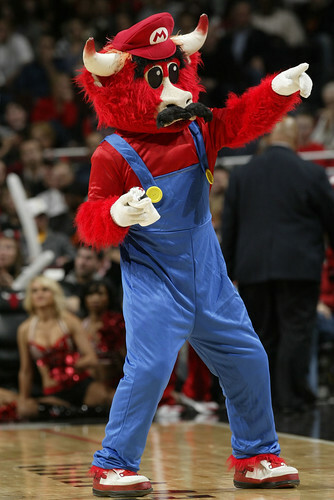 Thus in the late run when the Bulls outscored the Pistons 28-5 in the last eight minutes and 13-3 in the last four minutes when Noah returned after a solid run from Asik, Rose drove and pitched to Johnson for a corner three, Rose dribbled behind his back in traffic agaianst a closing double team and found Gibson for a slam dunk to make it 94-89, drew three defenders on a drive to enable Johnson to slip in for a follow slam dunk with 1:27 left to make it 96-89 and then hit a jumper to put it away at 98-89 with 41.9 seconds left. Well, you know what, they are not giving him open shots and certainly open lanes. 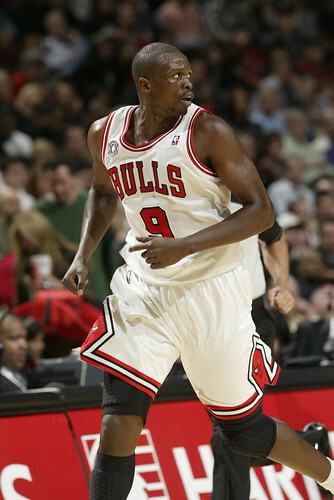 He’s basically the only real offensive weapon the Bulls have. I know this isn’t the Bad Boy Pistons of the 80’s with the Jordan rules, but their scouting report has everyone going toward Rose. I told Rose those lanes don’t look open to me. He said I wasn’t as quick as he was. This is that superstar thing you hear Jordan and Kobe and Magic and Bird talk about, of the game slowing down, the rim seeming bigger, the lanes seeming wider even though they aren’t. That’s not only how good they are but what separates them from mere professional basketball players, who are the best athletes in the world. The other guys don’t see those things, and they were all-Americans and Olympians. 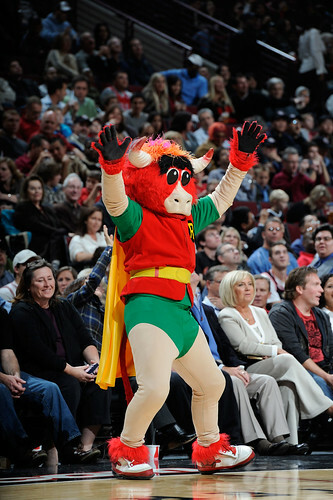 There are certain guys, not many, who just never believe they are going to lose, and the Bulls for the second time in franchise history have one of them. It’s not going to mean a championship in this 20th anniversary season, but it’s already producing some very special stuff. Well, someone did. I know I wasn’t one of them.